These points are awarded to players on an individual basis and reflect how well they portrayed their character. Was the character played in an entertaining fashion according to alignment and career? There will be times when it is obvious that players are running their characters simply as extensions of their own personality, and this need not be a bad thing, but the gamesmaster must decide whether the character’s career, alignment and background mean that he or she really should be different. Give each player a rating (this is probably something you should keep to yourself), along the lines of Bad, Poor, Average, Good or Excellent, and award 0-50 EPs as a recognition of the way the character has been ‘brought to life’. When allocating experience points for role-playing, you should bear in mind the player’s own conception of the character. 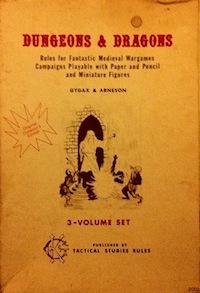 For example, a player may have decided that his dwarf is taciturn and consequently have very little to say during role-playing encounters, but become very active during more action-orientated situations. Generally, each player should receive 30 Experience Points per session for roleplaying, with some players gaining more and some less depending on the circumstances. Only those players who have impressed and amused you with their roleplaying should gain me maximum reward; conversely only those who have added nothing whatsoever to sessions should receive none You should avoid encouraging competition amongst the players – don’t always award the largest amounts to the player with the biggest mouth! I’ve never liked rules like this for a number of reasons. One, I feel uncomfortable judging and rewarding players by how well they have entertained me. Especially since this passage suggests keeping it secret from the player. If this is an incentive system, how can it function if the player does not know for what they are rewarded experience? That being said, I do like the idea of roleplaying XP, though I know this might be criticized by fundamentalists that believe XP should only be from treasure and monsters, preferably with more coming from treasure. If there are roleplaying XP though, I think they should be less subjective. Another flaw with awarding XP as suggested by Warhammer 1E is that in my experience such as system often leads to roleplaying caricatures rather than more balanced personalities, because caricatures stick out more. For example, a depressed character will be portrayed as moping all the time. One idea that I have been playing around with is to allow players to select some goals for their characters, the completion of which will result in XP rewards. Something like minor, substantive, and major goals which would award 100, 500, and 1000 XP respectively. A 100 XP goal might be something like getting a hellhound pelt crafted into a suit of leather armor, fashioning a hat out of a shroom head, or transcribing looted dwarven books and donating them to the library of Ioun (all actual examples from my current campaign). Some might object that that some of these things come with their own reward (like getting a suit of armor) but the same thing is true of treasure. The best part of this is that it seems like it would reward engagement with the setting. I’m always looking for ways that I can get players to be more self-directed. Adventure paths have trained players to just go along rather than venturing out on their own. Goals would need to be negotiated beforehand, and thus would not be arbitrary. A good goal, just like in real life, should be easily measurable. It also offloads some work from the referee to the players, which is often a good thing. This entry was posted in Uncategorized and tagged revisitation, Warhammer on May 5, 2012 by Necropraxis. RANSOMING PRISONERS: Organized tribes can optionally be allowed to take player characters prisoner, freeing one to return to the KEEP in order to bring a ransom back to free the captives. Set the sums low – 10 to 100 gold pieces (or a magic item which the ransoming monsters would find useful) per prisoner. If the ransom is paid, allow the characters to go free. Then, without telling the players, assume that this success brought fame to the capturing monsters, so their numbers will be increased by 2-12 additional members, and the tribe will also be very careful to watch for a return of the adventurers seeking revenge for their humiliating captivity. The period of extra alertness will last for 1-4 weeks; the increase in numbers is permanent. I am not in favor of all combats being deadly, even when the conflict is with agents of chaos. Cultists need live sacrifices, brigands need information about future targets, and everyone could reasonably desire gold from ransoms. Maybe live human is a goblin delicacy. But more important than narrative or naturalistic justifications, games where loosing a fight does not always mean a total party kill are more interesting and varied. However, this must be handled carefully. I strive to be an impartial referee, so unless there has been some very dramatic development during the course of a fight, I default to assuming that monsters are using deadly force. In other words, the key to fair play is deciding beforehand what the priorities of the opponents are. I also try to seed the environment with clues where appropriate so that skillful play and engagement with the setting can be rewarded. I never want “waking up captured” to be used to save a party of adventurers. The monsters are either seeking to kill or capture, and I will try to play them appropriately based on their priorities. Some way of tying this to the encounter reaction roll might be reasonable too, for cases where preplanning (random encounters, limited time) are not possible. Because I believe in giving players information about the consequences of their actions, I would also try to make sure that the players understand what was going on. Otherwise, how can they make informed decisions in the future? Perhaps the tribe starts putting up recruiting posters advertising the fact that they defeated the fearsome adventuring party. Much referee advice suggests that players should learn from their experiences, but if there is no way for the players to connect cause to effect, they are more likely to just assume that developments are by referee fiat or based on dice. Many players by default assume that the referee just does whatever they hell they feel like at any given time (“rocks fall, everyone dies”), so I believe it is worthwhile to spend extra effort countering this assumption. This entry was posted in Uncategorized and tagged revisitation on March 4, 2012 by Necropraxis. A normal human is a human who does not seek dangerous adventure. A normal human does not have a class. … As soon as a human gets experience points through an adventure, that person must choose a character class. So this is how humans in Moldvay D&D become adventurers: not by training, not by having exceptional ability scores, but rather by sheer audacity. Retainers (at least the kind recruited in a tavern) should probably have the statistics of normal humans. Once they survive their first excursion into the underworld or wilderness, perhaps the player of their employer should be allowed to select the retainer’s class? That would help give the player a stake in the fate of the retainer, and maybe also be a good time to introduce the traditional idea of the retainer as a PC-in-waiting. I’ve liked that idea ever since I read about it, but I have never seen it used in play. Finding a retainer with a class (like some of the NPCs in Bone Hill) could be a special occurrence, almost form of treasure or reward, rather than a disposable grunt. Especially if that means that dying means that you go back to level N (where N is the level of your highest retainer) rather than level 1. That, however, is probably anathema to many new school players, who suffer from “my precious character” syndrome just as much as many referees suffer from “my precious encounter” syndrome. Many people are only happy with wish-fulfillment characters, which also undergirds much of the drive for being able to control every aspect of character creation. When discussing normal humans, it is also perhaps worthwhile to note that many monsters in the bestiary are in fact thinly disguised versions of other monsters with minor cosmetic changes and trivial rules differences. There are four alternate type of troll, for example, in the Fiend Folio (giant troll, giant two-headed troll, ice troll, and spirit troll, in case you were curious). I would argue that most of the humanoid races as presented in D&D are pretty much just this. Much like the aliens of Star Trek, they are just humans in makeup. Humanoids are basically man-like creatures who have a gimmick and are present merely to give PCs intelligent, organized opponents which can be slaughtered wholesale with little reflection, remorse, or consequence. Whenever you think to introduce a humanoid, just ask yourself, “Why would these not work as humans?” Much of the time it is of the desire to not portray humans of a barbaric bent as savages. This also allows the referee to keep the truly monstrous humanoids waiting in the wings for portrayals such as Beedo’s Orcs of Gothic Greyhawk or my own Goblins as Corruption. And to make more use of the monster entry on page B40: the normal human. This entry was posted in Uncategorized and tagged revisitation on January 13, 2012 by Necropraxis. If the DM permits it, mules can be taken into dungeons. A mule can carry a normal load of 2000 coins (or 4000 coins at most, with its move reduced to 60’/turn). That’s 200-400 extra pounds of equipment or treasure. No XP sponge (the mule does not get a share of XP). Minimal chance of theft or rebellion (unlike some retainers). Monster detection system. Presumably one could get the same benefit from a trained war dog, but a mule might be less likely to die in combat partway through the expedition, since it is probably not going to be an active aggressor. Mules are still used by the US Air Force in Afghanistan. I would say that mules compare favorably to hired porters. Unlike most other game components, mules are primarily about encumbrance. Their function is to carry things. 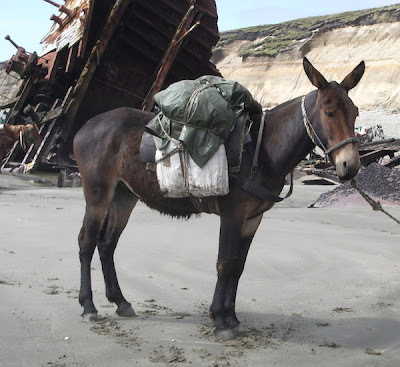 If you are not using encumbrance rules, don’t be surprised if your players ignore mules. I have never been satisfied with the old coin-based encumbrance system, or more “realistic” systems that sum weight carried (realistic is in scare quotes because such sums don’t take into consideration awkward items or how the weight is distributed, which is just as, if not more, important than the absolute quantity carried). Luckily, the LotFP encumbrance system (free Rules & Magic book, pages 38-40) covers mounts and pack animals as well, though there is no dedicated encumbrance record sheet for animals yet (something I hope to rectify soon — it’s on my list of things to do). Players can train mules in uninhabited caves and ruined fortifications, offending their sensibilities until the animals are used to odd smells, dank dungeons, and strange noises. All of this takes time — up to several months if you want a really good mule — but the players can hire someone else to do the job so that they remain free to go adventuring while the mule is being trained. The article goes on to say that a druid could do this through magic more quickly. As long as an adventuring party is not asking their mule to do anything ridiculous, I don’t think I would require special training. If that’s not enough, you can go read the 121 post (at the time of this writing) Dragonsfoot thread on mules, from which some of these observations were drawn. This entry was posted in Uncategorized and tagged revisitation on January 4, 2012 by Necropraxis.